Is it possible to edit the tag description of a synonymous tag? 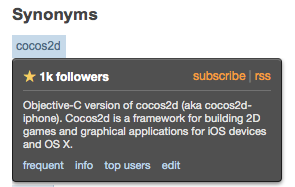 This is regarding the cocos2d tag which is a synonym for the cocos2d-iphone tag. Unfortunately many users type in "cocos2d" in their questions which expands to cocos2d-iphone even though their question has nothing to do with that specific version of cocos2d. However when I try to edit this tag it only shows the [cocos2d-iphone] description and clicking edit starts editing the description of [cocos2d-iphone]. I wanted to modify the [cocos2d] description so that it reads like the [cocos2d-iphone] tag description or maybe even just saying "DO NOT USE THIS TAG" (though I'm sure SO has developed better solutions for such cases). Is it possible to edit the original [cocos2d] tag's description? If not what else can/should be done about the confusing fact that people type [cocos2d] and hence add [cocos2d-iphone] tags even to unrelated questions concerning cocos2d-android, cocos2d-x, cocos2d-html5, and so on? I'm all in favor of simply removing the [cocos2d] tag altogether (merge it into [cocos2d-iphone]) because there are very little overarching, unifying "cocos2d" elements and as is all questions relating multiple versions of the engine (or a common element) are being tagged with multiple cocos2d tags anyway. I've also retagged the few [cocos2d] (originally referring to [cocos2d-python]) tags in the past anyway, so there's no need in keeping the [cocos2d] tag come to think of it. I assume you hit a bug but we have to wait for confirmation. and hit the edit tag wiki button. Not the answer you're looking for? Browse other questions tagged support tags suggested-edits retag-request tag-synonyms . When exactly are tags created? Which tag(s) to use for Python typing questions? Did I do the right thing in rolling back this edit?